The Panel Station is an online market research community which helps the global brands in building better products based on your opinions regarding consumer goods, technology, healthcare, travel, finance & more. Moreover, you’ll earn amazing rewards for sharing your opinions and thoughts in the form of surveys. You can get Rs 300 as Reward with the Panel Station Survey Offer and redeem it as Paytm, Freecharge, Flipkart, Amazon Vouchers and other exciting gifts. Just take the surveys and earn bigger rewards. Isn’t awesome? The Panel Station survey hardly takes 5-10 minutes to complete and the reward points depends on the length of every survey. This is a 100% genuine offer. You just have to share your opinion on the products and services you use and get amazing rewards for it. So what are you waiting for, take some simple surveys and earn awesome rewards now. Below we have mentioned all the steps on how you participate in The Panel Station Survey Offer and redeem your rewards. To get started all you need to is complete your registration at The Panel Station website and follow the procedure. Just participate in surveys to earn reward points and those reward points can be redeemed in form of paytm cash. So we can say this is another way to earn free paytm cash online. 2. Start filling the registration form. Enter all the required details like name, email id, etc. and then click on “Start Earning“. Remember – While signing up, you can select your city as any metro city like Delhi or Mumbai, so as to get maximum number of surveys. 3. Now you will receive a mail on your registered email Id for verification. Open the mail and click on “Confirm“. 4. After this, you will again receive a mail which will contain your login credentials i.e. Username & Password. Your account is now successfully created and is ready to reward you on your surveys. 1. Visit Offer Page and login for your account. 2. Initially you will receive some profiler surveys. After filling this profiling information, you will start receiving surveys with reward points ranging from 100–5000 points. 3. Start taking those surveys and accumulate your rewards points in your account. To redeem your rewards points, you need a minimum of 3000 points. After you have 3000 points = Rs 300 in your account, you can redeem them as Paytm, Flipkart, Amazon, Freecharge Vouchers or many other exciting gifts. 1. Visit here to Redeem your Reward points. 2. Select the Vouchers according to your wish like Paytm, Amazon, Flipkart, Freecharge, etc. 3. And soon your vouchers will be sent to your email Id within 6-8 weeks. Hope you like our article regarding The Panel Station Survey Offer to earn free patym cash. Please share our article via social sharing icons provided below. Each share worth a lot for us.Keep sharing, keep earning . 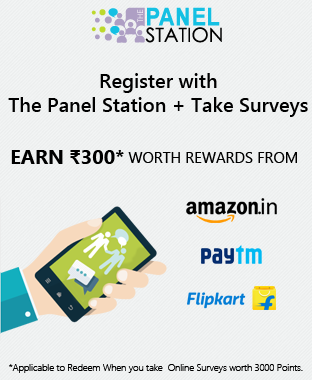 3 Responses to "Panel Station Survey Offer – Earn Rs 300 Paytm Cash"